Bury St. Edmunds was the burial place of St. Edmund, a Saxon King of East Anglia, martyred in 869 by Viking invaders who had also martyred St. Fremund in 866. John Lydgate (probably from Lidgate, 10 miles from Bury), a monk of the abbey of Bury St. Edmunds and one of the most prolific writers of Middle English, translated this work from Latin into English to be presented to the 12-year-old King Henry VI, to commemorate his stay at Bury from Christmas 1433 to Easter 1434. It is likely that this manuscript was made at Bury under Lydgate's supervision for presentation to the king. 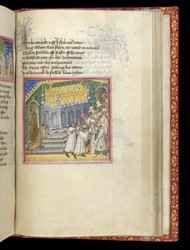 This miniature depicts a story in which a woman guilty of a crime sought sanctuary at St Edmund's Shrine, but was seized b the sheriff and his men anyway. The result was that the sheriff died a sudden death before the woman could be sentenced.